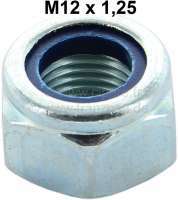 sample image Nut lock M12 x 1,25. Installed at shock absorber pins Citroen 2CV + at the tie rod of Citroen DS. 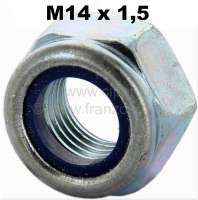 sample image Nut selflocking M14 x 1,5. 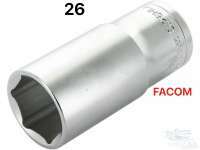 Installed at shock absorber pin (14mm) Citroen AK, ACDY, AMI. sample image Shock absorber (2 fittings) in the rear, for Citroen 2CV. For 12mm shock absorber securement. Manufacturer "Record France". Price is for 2 fittings. Mounting: Synthetic cap to the wheel! The shock absorbers please 5x push through, before they are mounted. Air in the shock absorber is removed! 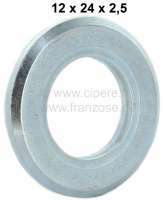 sample image Shock absorber (2 fittings) in front, for Citroen 2CV. For 12mm shock absorber securement. Manufacturer "Record France". Price is for 2 fittings. Mounting: Synthetic cap to the wheel! The shock absorbers please 5x push through, before they are mounted. Air in the shock absorber is removed! sample image Shock absorber rear, suitable for Citroen 2CV (per piece). 12mm securement eye. Manufacturer Boge Sachs! The Boge Sachs shock absorber is very soft! sample image Shock absorber rear, suitable for Citroen ACDY. (Dyane Van). Installation: The plastic cap to the wheel. Per piece! sample image Shock absorber in front, suitable for Citroen 2CV (per piece). 12mm securement eye. Manufacturer Boge Sachs! The Boge Sachs shock absorber is very soft! 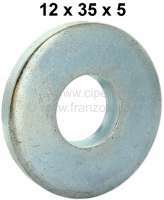 sample image Shock absorber pin - disk heavily, suitable for Citroen 2CV (12mm). Or.Nr. : AM436-256. Made in Germany. 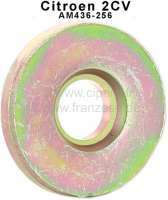 sample image Shock absorber pin - disk heavily, suitable for Citroen AK, AMI, ACADIANE (14mm). sample image Shock absorber pin - washer, small version. Suitable for Citroen 2CV with 12mm shock absorber pin. sample image Shock absorber pin - washer, medium version. Suitable for Citroen 2CV with 12mm shock absorber pin. Measurement: 12 x 35 x 5mm. sample image 26 long nut, for the original shock absorber pin. Suitable for Citroen 2CV. Original one, our shock absorber pin 12066 is fastened with a 27mm key! sample image Shock absorber pin at the suspension pot, suitable for Citroen 2CV. 12mm diameter. 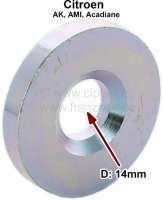 For 26mm tool mounting. Bad reproduction. sample image Shock absorber pin at the suspension pot, suitable for Citroen 2CV. 12mm thread diameter for the shock absorber. Made one in Germany, from high-strength steel. sample image Shock absorber pin at the suspension pot, suitable for Citroen AK, ACDY, AMI. 14mm diameter. Reproduction. sample image Front axle cover plate on the left, with stud bolt (12mm diameter) for the securement of the shock absorber. Suitable for Citroen 2CV. Made in Germany. sample image Front axle cover plate on the right, with stud bolt (12mm diameter) for the securement of the shock absorber. Suitable for Citroen 2CV. Made in Germany.